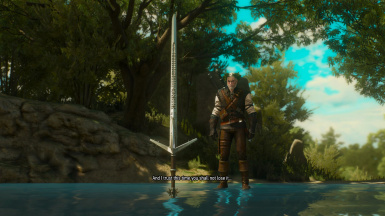 This is a simple mod that automatically levels your Aerondight sword when you level up. In other words, the damage of the sword will scale automatically with your character level without you having to manually grind for the permanent damage boost each time you gain a level. Tested with GOG GOTY 1.32 version of the game. Have not been able to test any other version so please post in the "Bugs" section if you encounter any problems with a different version of the game. Note: This mod does not change the actual sword item level. Only the damage of the sword to match the level. I am not responsible if my mod isn't compatible with any other mods that modify the files mentioned above. In the case that this mod conflicts with any of your currently installed mods please attempt to resolve the issue with Script Merger (by AnotherSymbiote)﻿ first. Simply extract the downloaded .zip and put the "modAerondightAutoLevel" folder into your "Witcher3/mods" folder. NOTE: If you are already using my other "Aerondight Permanent Glow" mod and you want to use this mod alongside it, please download the optional download in the "Files" section to avoid conflicts. The optional download is a mod that combines both of these mods into a single mod.